Among the activities of the Telefónica-UOC Chair in Multimedia Design and Creation is the production of free publications that include documentation about meetings, workshops and seminars. 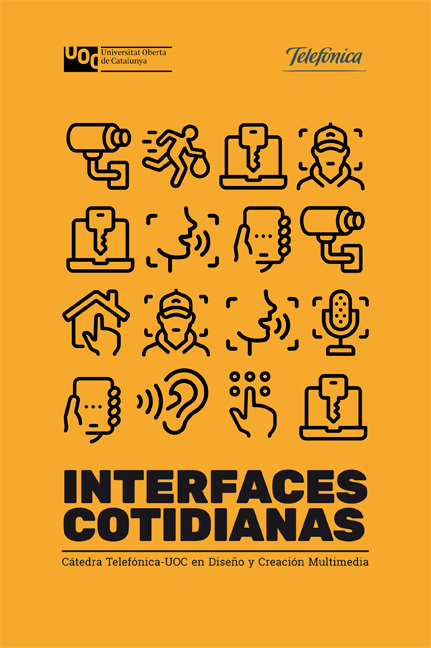 When the interface disappears: this brief introduction reviews the history of the user interface to analyze its next step, the Zero UI or interface integrated into our environment through sensors, attached to clothing or the body. Peripherals: the devices that surround the computer screen have acquired a protagonism of their own, being the object of experimentation in new user interfaces and sometimes replacing the PC anchored to the desktop. The future can be seen in the Virtual Reality desk and the Augmented Reality glasses. The interactive home: the domestic environment is currently the battleground for large companies that strive to integrate their products into the most intimate consumer environment, where they can develop new forms of interaction in a controlled environment, capture (even) more data about the user and create an affective bond with their products. Voice assistants, loudspeakers and other connected devices are making their way into our homes. The body as an interface: intelligent clothing, glasses, sensors that correct posture or even tattoos are some of the devices that are being developed to achieve a more immediate and intuitive interaction, while integrated into our daily lives. Under surveillance: all the services that are provided free of charge and the devices that surround us are nourished by our data. The publication closes with this reflection that exemplifies projects such as Amazon Go, the intelligent grocery store that allows us to leave without going through the checkout process in exchange for subjecting all our actions within the store to strict surveillance. The publication is completed with a list of bibliographical references and links to websites that allow to explore the contents exposed in the texts in greater depth. Available in Spanish only, the publication can be downloaded in PDF format here.